About this Quick - Release 60 Polyester Tape Measure:60" retractable polyester tape.Standard and metric measurements.Tape automatically stops at desired distance when extracted.Quick-release button rewinds tape into case.Material: Plastic case with polyester tape measure.Special Instructions:1 Day Rush, available upon request for 1 color, 1 imprint location orders. About this Construction Pro 10 Tape Measure:A 10-foot steel, ½"-wide tape combines both inch and metric measurements and auto rewind.Each tape features a soft-touch, stop-and-release button, attractive, nickel-plated, belt clip and a black, nylon wrist strap.Material: Impact Styrene. About this Tool Pen With Screwdrivers And Light:1 Phillips Head, 1 Torx Head And 1 Flat Head Bit.Magnetic Port For Accepting Bits.Twist Action.Rubber Grip For Writing Comfort And Control.Extra Bright White LED Light.Twist Top To Turn On/Off.Button Cell Battery Included.Special Instructions:Multicolor imprint is available, Please call for service.Rush Service:Catalog Quantities Only.One Color And One Location. About this Slim Multi Tool 15- IN -1:A 15-in-1 multi tool slim enough to fit in your wallet. Ready to be used whenever needed. The tool features a can opener, knife edge, screwdriver, ruler, can opener, 4 wrench sizes, butterfly wrench, saw blade, direction ancillary indication, 2 position wrench, and lanyard hole. Black pouch included. Material: Stainless Steel. Manufactured By Leeds.Special Instructions:Other imprint methods/areas may be available; please call for details. Please note that product images may not depict the standard imprint method included in pricing. About this Irwin Screwdriver Set with LED Flashlight:Compact multi-tool with 3 Philips and 3 flathead driver bits, LED light, level and 3' metal tape measure. Finish / Material: Plastic, Metal. Three mercury-free AG3 / LR41 batteries included.Flashlight: 3 Lumens.Special Instructions:Rush Service:1. Purchase Order must clearly state artwork instructions and logo to be used.2. One Color/One Location Imprint Only. About this WorkMate 16ft Tape Measure:Sixteen-foot retractable metal tape (inch and metric measurements). Lock button. Rubber casing with wrist strap. Metal belt clip. Manufactured By Leeds. Note: Instructions Included: No Materials: ABS PlasticSpecial Instructions:Other imprint methods/areas may be available; please call for details. Please note that product images may not depict the standard imprint method included in pricing. About this 7- in -1 Allen Key Multi - Tool Set:Seven piece multi-tool set includes five Allen Keys: 2mm, 2.5mm, 3mm, 4mm, 5mm, and two screwdrivers: a Phillips and a slotted. Material: Double Wall Plastic.Special Instructions:Other imprint methods/areas may be available; please call for details. Please note that product images may not depict the standard imprint method included in pricing. About this Rugged Locking Tape Measure:10-foot retractable tape measure.Standard and metric measurements.Rubber casing.Sturdy plastic wrist strap.Slide locking button locks tape in place.Metal belt clip on back.Material: Plastic case with metal tape measure.Special Instructions:1 Day Rush, available upon request for 1 color, 1 imprint location orders. About this The Pro Locking Tape Measure:25-foot retractable tape measure.Standard and metric measurements.Rubber casing.Rubberized wrist strap.Slide locking button locks tape in place.Metal belt clip on back.Material: Plastic case with metal tape measure.Special Instructions:1 Day Rush, available upon request for 1 color, 1 imprint location orders. About this The Handyman Locking Tape Measure:10-foot retractable tape measure.Standard and metric measurements.Woven nylon wrist strap.Slide-locking button locks tape in place.Metal belt-clip on back.Material: Plastic case with metal tape measure.Special Instructions:1 Day Rush, available upon request for 1 color, 1 imprint location orders. About this The Journeyman Locking Tape Measure:10-foot retractable tape measure.Standard and metric measurements.Rubber casing.Sturdy plastic wrist strap.Slide locking button locks tape in place.Metal belt-clip on back.Special Instructions:1 Day Rush, available upon request for 1 color, 1 imprint location orders. About this Combo Tape Measure / Level:10-foot retractable, locking tape measure.Built-in level.Includes 1-3/4" x 1-3/4" yellow sticky memo pad, mini pen and metal belt clip.Locking button on bottom of item keeps tape in place.Clear flip-top cover protects memo pad.Material: Plastic case with metal tape measure.Special Instructions:1 Day Rush, available upon request for 1 color, 1 imprint location orders. Thank you Lindsey! Our Handy Cutter Box Opener is highly recommended to give as a giveaway. Many customers love to receive this promotional tool for their home necessities. 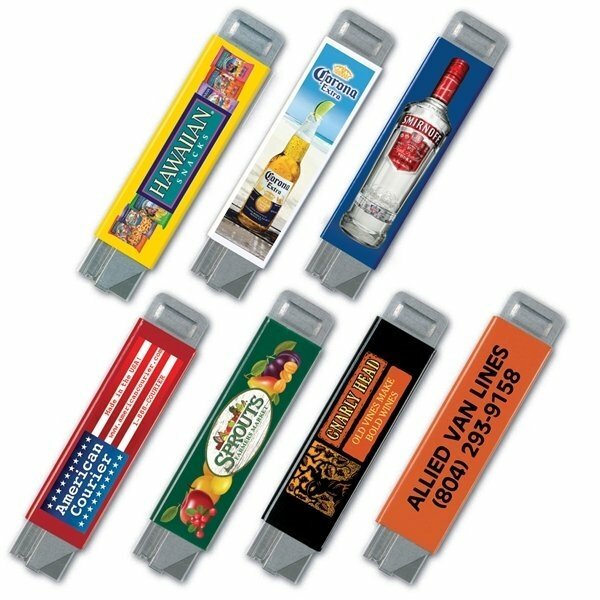 Let your company logo be represented on this fun item customers will love to have. From homeowners to employees, the Handy Cutter Box opener is a handy tool to own. USA-made All-Metal Box Cutter with easily replaceable stainless steel blade. Great tool for desks, offices, and warehouses. The only 100% Made in USA box cutter. Available in red, orange, yellow, white, green, blue, black. Does this item make the cut? Order now! Thank you Chase and Elizabeth! Our sales team works hard to ensure quality service. They are always available to help you complete your precise order. Our Leatherman Wave Stainless Steel Tool has so many different gadgets for every use. Your customers will love to use this product and will definitely carry around this hand tool. 100% Stainless Steel Body, Needlenose Pliers, Regular Pliers, Wire Cutters, Hard-wire Cutters, 420HC Knife, 420HC Serrated Knife, Saw, Scissors, Wood/Metal File, Diamond-coated File, Large Bit Driver, Small Bit Driver, Medium Screwdriver, Ruler (8"), Bottle Opener, Can Opener, Wire Stripper, Lanyard Ring, Leatherman Sheath Included. Join the wave and order today! Thank you Wes and Stella. This measuring tape is included in our Top 100 because of its top quality features. This heavy duty measuring tape will give a long-lasting impression to your customer. The retractable tape measure is clearly marked in both inch and metric measurements. 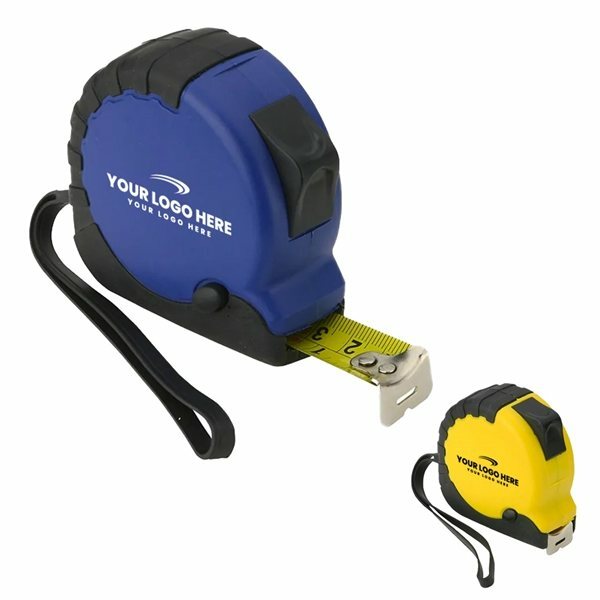 The Custom Measure All Tape Measure comes in blue and yellow colors. The Custom Measure All Tape Measure is made from a durable APS plastic. This measuring tape has a lock button and a metal belt clip making it easy and safe to use. Both the grip and lanyard on the Custom Measure All Tape Measure are made from rubber. This heavy duty tape measure will be an asset on any job site. If you have a new construction business or have your own woodworking business, introduce yourself by sending potential clients the Custom Measure All Tape Measure with your name imprinted on it. The Custom Measure All Tape Measure is made of Rubber, ABS, Steel. Measure up to your customer’s expectations, and order here. With over 600+ promotional hand tools in our selection, you’ll be sure to find the perfect one for your company. All our products are convenient for all customers to use. From mini flashlights to stainless steel knife to measuring tapes, we have a wide selection of automotive hand tools ready for customization on our website! Your customers will love to have handy tools at their disposal. Whether it’s a home & garden tradeshow or an automotive tradeshow, these hand tools can come very handy to any customer. Even employees will love to receive handy tools. Lend a helping hand with the tool of your choice. Imagine your company logo at the hand of many customers. Check out our huge selection of hand tools here! Our custom tape measures and multi function hand tools are durable, practical and effective promo items. Every eye catching piece is specially priced and professionally imprinted to vividly promote your brand long after it's handed out. Let’s make marketing make sense! Enjoy our huge selection of promotional hand tools. Check out more cool tools on sale now! Take a sneak peek at our stock of customized tape measures and multi function hand tools currently available. Feel free to give us a call, and we’ll help expedite your order! Hand tools are popular with everyone. Customers love to keep handy tools closeby for just incase reasons. Be the reason why a customer is able to have a hand tool nearby. Our most trending promotional tools are always top quality. We always make sure that not only you will love the product, but also your customer. Our hand tools always live up to the high expectations. Need help looking through our vast selection of hand tool items?